Reality check – goodbye green 2CV – HubNut – celebrating the average! Despite my best intentions, the Seabrook Fleet this year has proved about as stable as a new born foal atop a giant jelly. I couldn’t resist when a 2CV restoration project came up for grabs locally. I had all manner of grand plans, and even managed to get it running after a ten year slumber. Sadly, my grand plans were not to be. The problem is funds. I’ve been too busy spending elsewhere – the 2CV’s £500 MOT bill, the BX’s £500 worth of maintenance and a £450 Land Rover Discovery. All have been deemed more important than the poor 2CV, which has been sitting in the garage awaiting salvation. No more! 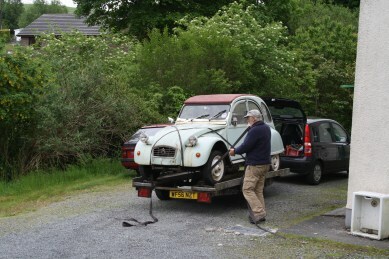 2CV off to a new life! Again. Yes, I thought it an ambitious tow car too but the trailer is super-lightweight, as is the 2CV. Note that the strapping across the bonnet is to stop it falling off. The axles are strapped to hold the car to the trailer. And yes, it is actually very nicely balanced! Anyway, it’s off to its new life in Devon. I hope this time it’ll manage to reach the road by its own power.